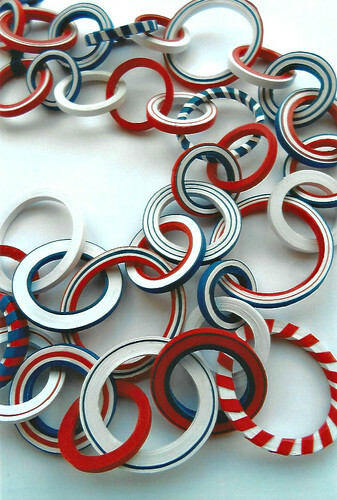 I have so many paper jewelry examples to show you, I hardly know where to start! All were made by Licia Politis for a Friends of Hazelhurst exhibition she participated in near Sydney, Australia earlier this month. 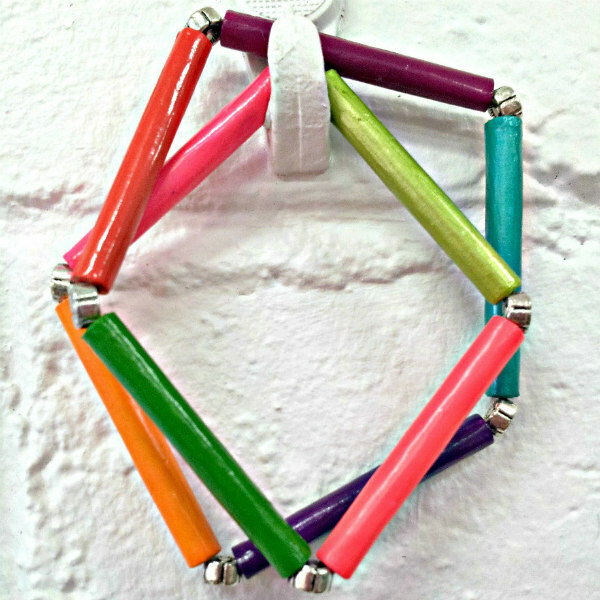 Today Licia generously shares many tips on how to make colorful art pieces to accent your summer wardrobe. If the name is familiar to you, it's probably because of her remarkably detailed quilling works that have been featured on the blog previously (for example, here, here, and here). 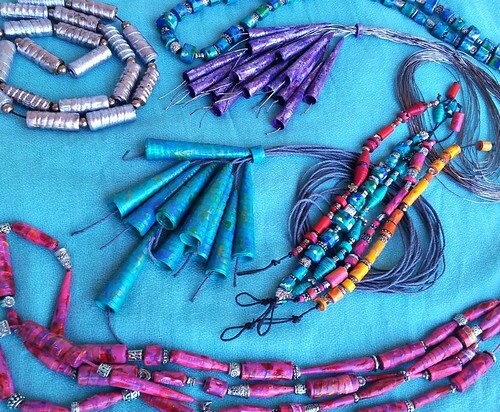 If you've never tried making paper beads, they are very fun to do. Repetitive yes, but what type of hands-on making isn't? Licia told me she had been rolling beads for months whenever she would get a few spare minutes between customers at the shop where she works, so had a big batch ready to be assembled into necklaces and bracelets in the couple of weeks between being accepted into the show and the opening. Licia uses vivid nail polish as paint and adds silver spacer beads for interest. 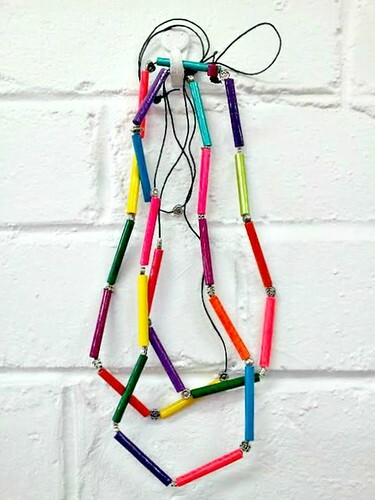 The pink double strand necklace above is a mixed media piece called Mrs Cotton Candy... she likes to give each one a playful name. Licia collaged bits of text and wrapped some of the recycled paper beads with strips of quilling paper before applying a final coat of polish. 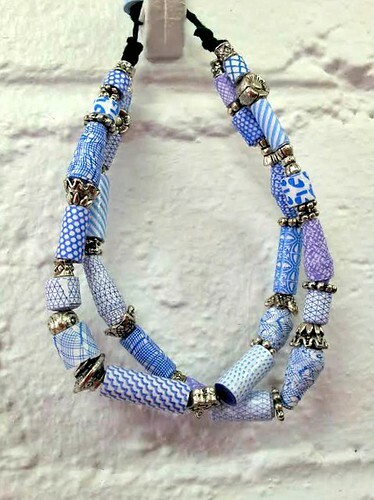 Mrs Express is a double strand bracelet made of beads whose paper strips were cut from blue and white security envelopes. 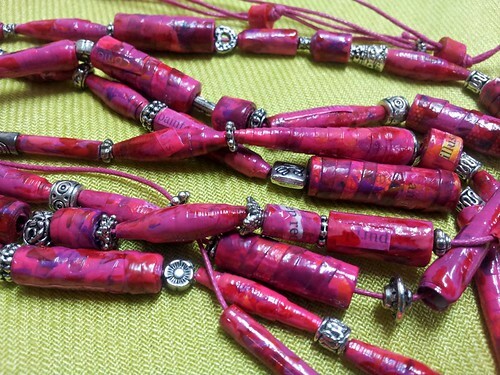 She sprayed protectant varnish on the beads before threading them onto Paperphine paper twine. Sometimes Licia uses fine, clear elastic instead, but tying the twine into a small loop at one end and a single bead at the other (as seen in the second photo from top) works well as a closure too. 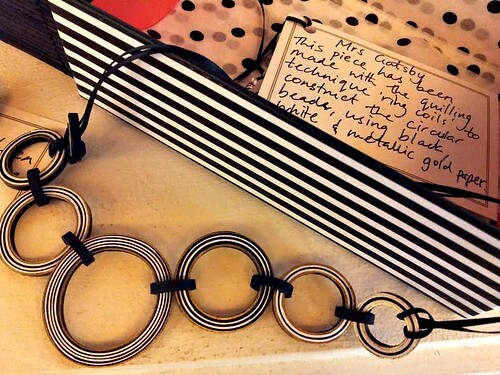 Mrs Gatsby is a sophisticated necklace that features black, white, and gold-edge metallic paper, and interlocking ring coils in various sizes. Mrs Warhol is a double strand of bright, elongated beads created from 1.5 inch (4 cm) x 6 inch (15 cm) recycled paper strips that were rolled on a toothpick and coated with several layers of nail polish. Again, metal spacers were added and the beads were threaded onto black paper twine. Scarlett O'Hara and Miss Audrey feature smaller beads made with narrow strips of paper. 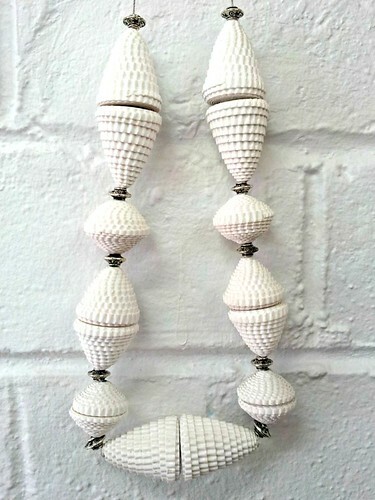 Below is an Angela Simone-inspired necklace of chunky, crimped beads. Licia rolled white, corrugated card stock, used her fingers to shape the discs into cones, coated each with white nail polish, and then sprayed the whole piece with several light coats of lacquer. Lastly, Hello Sailor is fittingly patriotic in red, white, and blue for Memorial Day here in the States. You'll find a complete tutorial over at Cut Out & Keep for this hand drawn Jungle Beads Necklace that Licia created for my All Things Paper book. The instructions detail even more tips for making paper beads, Licia-style. 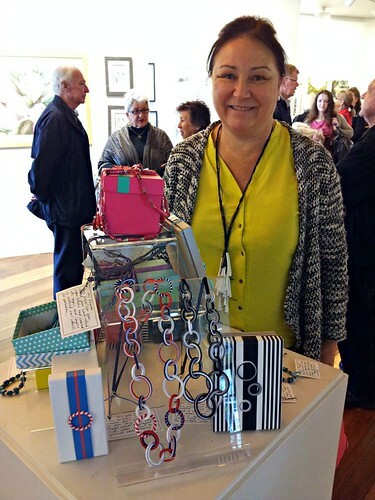 Here she is at the Hazelhurst opening; each jewelry piece was displayed with a coordinated box. Licia doesn't have a website, but can be contacted at liciapolitis14 at gmail.com if you are interested in purchasing a custom piece. Love all the brilliant colour Licia's used. I am tempted to try her interlocked ring coil neck lace. 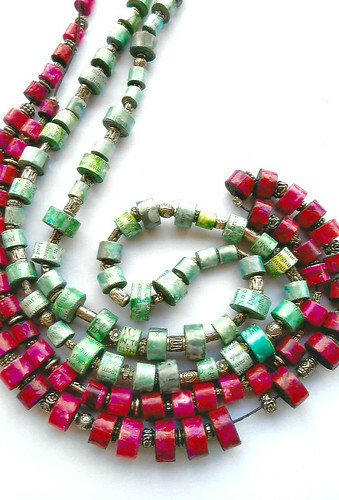 These beads are just gorgeous, I also love the colorful work of Licia Politis. Thanks for the link to the Jungle beads necklace Ann. Thanks for sharing! These paper beads look fresh and different. Well done, Licia! I'm glad you like them, Susan! These necklaces are a wonderful and great job. I remain impressed with such beauty!